Superbrothers: Sword and Sworcery EP, winner of the 12th Annual Game Developers Choice Awards Best Handheld/Mobile Game, has received well-earned praise all around the globe. Now, the creators are finishing their victory lap around the globe with a visit to Tokyo. At an event in Japan, Craig Adams of Superbrothers and Kris Piotrowski of Capybara Games together with Goichi Suda (otherwise known as Suda 51) of Grasshopper Manufacture (of Killer 7, No More Heroes, and the recently released Lollipop Chainsaw fame), announced the release of the Japanese version, スキタイのムスメ：音響的冒剣劇 (sukitai no musume: onnkyouteki boukenngeki) as well as the release of the remix album, The Scythian Steppes. The event was hosted by 8-4, Ltd., the company that also localized the game for Japan. The Japanese version of the game features some additional functions as well as new voice acting. 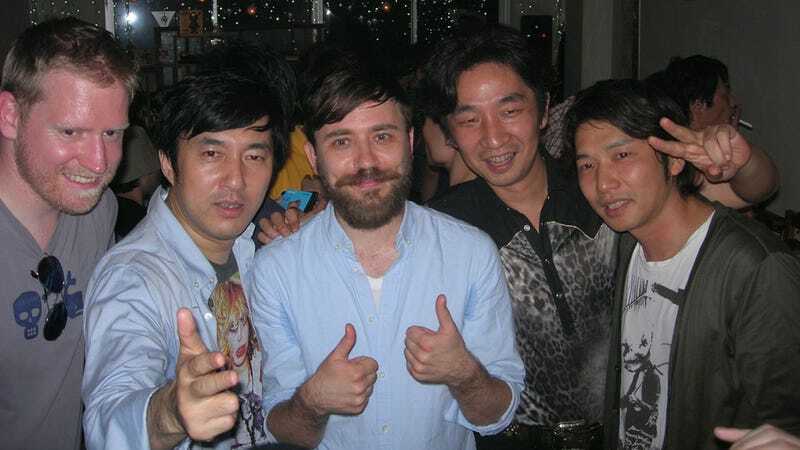 Suda himself did the voice work for the character of Logfella. As an added bonus, people in Japan who already purchased the English version can update to the Japanese version for free. The remix album, featuring mixes from major video game music artists including Akira Yamaoka (Silent Hill) and Michiru Yamane (Castelvania: Symphony of the Night) is also now available for fans to hear renditions of the amazing music from Sword and Sworcery.